A unique relic of the Cold War era in Berlin: a US 'Field Station', i.e. a listening post from where the USA (and Britain) could spy on Eastern Bloc communications. The top-secret operations ended after the Fall of the Berlin Wall and the end of the Cold War, and the Americans left the station in the early 1990s. After years of being abandoned, and vandalized, and after long disputes over the ownership of the site and what possible uses it could have, it now seems settled that the place is to be protected and preserved as a historical monument. It is still rather wild, atmosphere-wise, but access is now regulated and guided tours are offered. More background info: At the end of WWII, much of Berlin lay in ruins – about half of all houses were either destroyed or no longer safe to inhabit. Everywhere lay rubble – in total something like 75 million cubic metres of rubble. In order to make it possible to start rebuilding the city and its infrastructure, the rubble had to be cleared away, as quickly and cheaply as possible. So, much of what could not be used in any other way (like intact bricks or metal beams) was simply carted away and piled in large heaps. These became Berlin's famous “Trümmerberge” (rubble mountains). Over a dozen such artificial hills grew in Berlin in the ca. 20-25 years after the end of the war. The previously almost completely flat landscape of Berlin was significantly altered. Teufelsberg, literally 'Devil's Mountain', was named after the nearby Teufelssee (Devil's Lake) and became the highest of all the Trümmerberge – over a quarter of all of Berlin's bombing rubble ended up here. Indeed until very recently its summit was the highest spot of land in all of Berlin – until 2015, that is, when another artificial hill in the north, in the district of Pankow, reached 122 metres, due to more material being deposited at the top. But that's merely two metres more than Teufelsberg's 120m. Other Trümmerberge were piled on top of whole buildings, in particular at Volkspark Friedrichshain and at today's Humboldthain park, where the remains of huge Flakbunkers were covered with rubble (see Berliner Unterwelten and cf. Augarten Flaktowers, Vienna). Similarly, Teufelsberg grew on top of the shells of the unfinished buildings that had been intended to become Adolf Hitler's military-technical academy (Wehrtechnische Fakultät), the construction of which was halted at the beginning of the war. So deep down inside the base of the mountain there is even a Nazi-era architectural relic – though it's invisible. 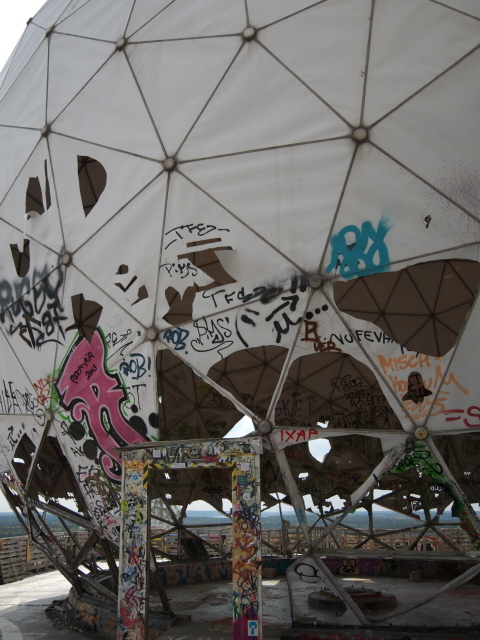 Teufelsberg's modern-day notoriety, however, derives from its role in the Cold War. As early as the 1950s, when the piling of rubble was still in full swing, the USA's military found the hill to be a suitable vantage point from which to spy on the new enemy in the east. After all, West Berlin was an Allied enclave right inside a Warsaw Pact country, the GDR, and the Soviet Union had lots of military installations within the GDR's territory too. Initially, the Americans used mobile radar trucks but soon became interested in erecting a permanent Field Station atop this convenient hill. This was begun in 1963. Rubble dumping ceased in 1972, and since then the surface was covered in topsoil and planted with trees to make the hill fit in with the surrounding Grunewald forest. At times the hill was also used for civilian pastimes such as a ski jump and for tobogganing, but the military use of the hill soon brought with it intense security measures and the summit was strictly out of bounds to everybody other than authorized military personnel. Teufelsberg was located within the British Sector, so the Americans had to commute to it from their sector. The British, however, also joined in the operations – as part of the “Five Eyes” intelligence alliance of the English-speaking countries USA, Britain, Canada, Australia and New Zealand, which still exists today. The French allies, on the other hand, were kept in the dark – and the Germans anyway. Naturally, what exactly the Americans and the British were doing here was top secret – and remains so today. Only from 2020 will some documentation emerge under the Freedom of Information Act, but sensitive passages will probably be blackened. What is clear is that the Teufelsberg Field Station was one of the largest and most active of all such installations of the NSA (National Security Agency) at the time. All that normal mortals could see of the station were its space-age-like white radomes that housed the listening station's radar antennas ('radome' is a portmanteau of 'radar' and 'dome'). They became a mysterious landmark of Berlin in the second half of the Cold War. When the Cold War came to an end after the Fall of the Berlin Wall, the Americans and the British gave up the Field Station – it was no longer deemed of any use. So they took out all the electronic equipment and all documentation, and left the buildings virtually empty. The tall main tower was for a few years in the 1990s used by Berlin's civilian air traffic controllers. For that a new radome was constructed – hence the different look. That installation was taken out again in 1999, and the place was abandoned. The government of Berlin, which had been handed ownership of the site by the Americans, had already sold it off to an investment group who had big plans for converting Teufelsberg into a cluster of luxury apartments, a hotel and a conference centre. But nothing came of those plans (mainly for financial reasons). At one point an esoteric Indian 'transcendental' organization contemplated purchasing the site to found a 'peace university' up here and build a new observation tower. All this fizzled out too (especially after the organization's “guru” died – the same one, by the way, that the Beatles and other celebrities came to see to seek enlightenment in the 1960s and 70s). For some years the site was secured by a fence and guards, but the latter were withdrawn in 2003 to save money. So the abandoned empty buildings attracted scores of urban explorers, but also vandalism. 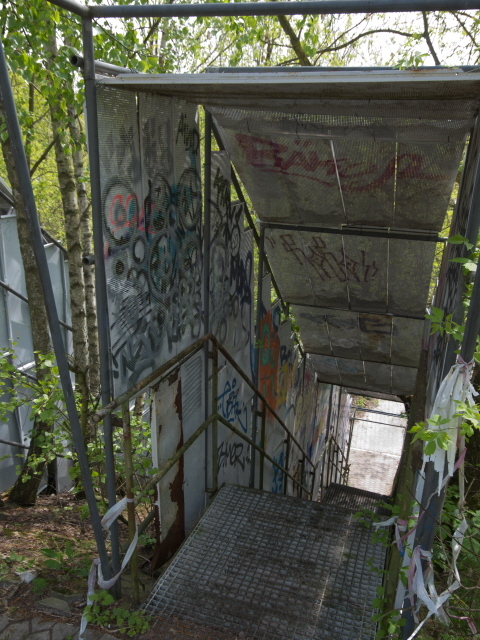 At times rave parties were held inside the former Field Station at night (much to the annoyance of the residents in the adjacent posh-villa neighbourhood of Grunewald). Soon enough rubbish, random destruction, anarchy and wild graffiti dominated the site. 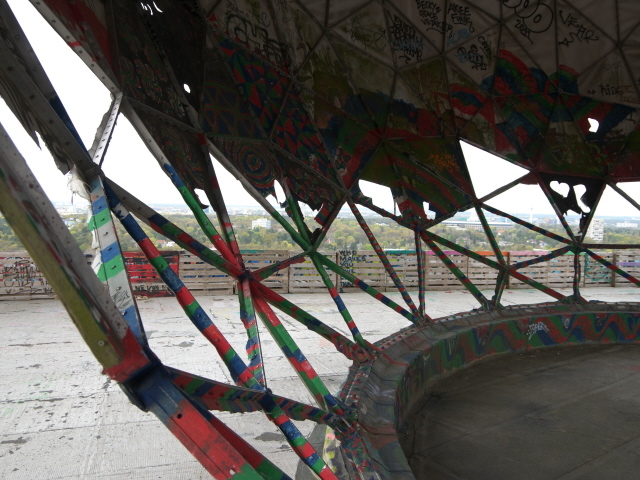 From 2011 some efforts were made to regulate access to the Teufelsberg site, clear some of the rubbish away, provide some protected space for artists and initiate guided tours for visitors. Going by the reports I've read from those years, however, it sounded rather dodgy what was going on here. Apparently (potential) visitors were threatened with violence if they tried to “trespass” into the fenced area. Since 2015, however, a new leaseholder has reached some agreement with the Berlin authorities to allow officially sanctioned, regulated access to the site for visitors. Since then, the guided tours described below have been offered. At the same time, the site retains the character of a countercultural hub that it had acquired over all those years before. There is a resident artists' colony here and now even international celebrity graffiti artists from all over the world are invited specifically to use the former Field Station's abundant windowless walls for their works of art. This has in the meantime grown into Europe's largest collection of such art. The legal certificate for building on the Teufelsberg has meanwhile expired too, so now the site's status is officially that of a protected recreational 'forest'. So nobody will be allowed to come up with new big and bold construction plans here. So in that sense, these unique Cold War relics are finally safe (for now at least). Whether there will be further commodification and more official commemoration of its history remains to be seen. At least two military veteran organizations are campaigning to have some sort of memorial developed at Teufelsberg. Whether that will ever happen is hard to predict. The visitation report below describes the situation in May 2016. Whether things will continue in exactly this same way for long is uncertain. There are probably more changes to come in the future. So this can only be taken as an interim report of sorts. When they collect your money they also hand you a sheet of paper on which you have to enter your name and signature. They didn't explicitly tell me in so many words, but this is the legal disclaimer that let's them off liability. I signed up for the historical guided tour, but before it started I was free to explore the site on my own for about 25 minutes. There were lots of really interesting graffiti to see – and other cool artwork too! So I was glad to have had a bit of extra time for this. When the tour began, it turned out the guide was actually an artist here too (though his works were no longer there), so in addition to the history, our group also got a lot of information on the arty side of this place. I considered this a bonus. Another bonus for the foreign participants on the tour was the fact that the guide was able to relay his narration, which is in German in the first instance, also in English. This meant, however, that the tour lasted quite a bit longer than the advertised 90 minutes. But I considered that an extra bonus too. The actual tour was preceded by a few admonishing words – especially that we had to stay with the group, and not try to enter any parts of the buildings that were not included in the tour. The reason for this is, of course, safety. The buildings of the Field Station (except for the ex-casino) do not have windows, so it's pitch-black dark in there. Furthermore, there are holes in the floors at several places where one could fall several storeys and break one's neck. Allegedly this did happen once – one person got in there and was never seen again. Or maybe that's just a scare story. The first half of the tour takes place outside the buildings. The history of the site as a Field Station was revealed – as far as that is possible, given the Cold War secrecy of the operations undertaken here. It was all put into contemporary contexts too – and the name Edward Snowden was dropped on several occasions. The post-Cold-War history of the site was extensively presented too, with all the chaos it has seen – see above. Eventually we entered the only building that is open to the public – but that is the one you will want to see the most: the block with the central tower and two large radomes on each side of it. Here some of the side walls are missing so light gets in. The more dangerous areas have been secured by means of “railings” and hole-covers fashioned from wooden pallets. On the first couple of floors the focus is on the art that has been produced here – and that still is being produced. At least two artists were there working on their respective pieces at the time of my visit. Most of the works would fall under the heading graffiti – or street art. Not all is sprayed, though, several are rather wall paintings. This graffiti to be seen here is mostly of high quality, not just the usual tags and simple smudges you know from urban landscapes in so many parts of the world. Quite a few works also convey intense political messages, others are just beautiful images, including some really surreal ones. I won't go into more details here, though (nor provide photos of the really good works), namely beacause a) I don't want to spoil it for prospective visitors, b) since it could all change again in the years to come, and c) if your really want to know you can find plenty of photos elsewhere on the Internet. From a dark-tourism perspective, the main attraction here anyway is getting inside those radomes. And after exploring the floors below for a while, we were eventually led up to the roof. The two radomes here are pretty battered. The tough cloth of the irregular triangles that form the radome skin has been ripped by means of cutters or other vandalizing means, and as far as one could reach there is wild graffiti (not of the arty variety). Still, it is quite cool to be standing in the centre of such a structure, even though all the technology has been removed. The highlight of the tour is reaching the top of the central tower (via a staircase that is at times pitch-black dark – so best bring a torch, or use the torch function on your smartphone). The radome at the top of this tower is structurally still intact, so you get the fantastic acoustics inside this sphere to full effect. The radome skin here is made of hexagons, not triangles, and it looks much tougher too and is less transparent. That is so because this is not original but was installed when the Berlin air traffic controllers used the tower for a number of years in the 1990s (see above). On the inside is painted a really huge ensemble of 'graffiti' (if you want to call it that) which also looks pretty spooky. I forgot the deeper philosophical message it was supposed to convey, but it's surely quite stunning to behold just from a visual point of view (see the photos below). From a small window-like gap on one side you can get a good view north towards the Olympic Stadium. From the floors below you can also see across other parts of Berlin, all the way to the centre with the TV Tower. From here, the much closer Funkturm looks almost the same height – but that's just an optical illusion. We were then led back to the gate and with that the tour was concluded. I thought it was money well spent. The extra historical narrative and also the comments on the art to be seen here certainly brought the site to life. If you just look around in silence, you miss out on all that. However, if all you want is to go up into the radomes, then you do not need those extras. The decision is yours. I found it well worth the extra cost. Location: in the northern half of the extensive Grunewald forest/park in the district of the same name (part of Charlottenburg-Wilmersdorf) in south-western Berlin. The official address is Teufelsseechaussee 10, 14193 Berlin. Access and costs: off the beaten track and requiring an uphill hike to get there; access is restricted and not free, a general admission fee is charged and historical guided tours cost extra. Details: The nearest public transport access is by S-Bahn (regional metro train). The slightly easier option (navigation-wise) is to get to Heerstraﾟe station (S9/S75 in the direction of Spandau) and then head south along Teufelsseechaussee. When you get just past the foot of the Drachenberg hill, a path branches off to the right. And this eventually takes you straight to the gate of the complex. The walk takes about 25-30 minutes. If you stay on Teufelsseechaussee there are other options of using smaller paths up the hill later, but these are a bit more confusing and you could get lost. South of Teufelsberg, the paved road splits and the right turn will also take you to the gate in the end, but it's a longer route. In any case you have to walk – and then climb the hill – on foot, so it's a bit of a hike. Using the paved access road you could also get there by bike, and in theory even by car, but parking is tricky here (not much space outside the complex, and they wouldn't let you drive into it). Opening times: the gates open every day from 12 noon until sunset, last admission one hour before. Regular tours (without historical narration) take place every hour, roughly on the hour and take ca. 60 minutes. The historical tours naturally last longer (ca. 90 minutes to two hours) and take place on Saturdays and Sundays only at 1 p.m. Admission: regular 7 EUR (including 'silent' tour); historical guided tour: 15 EUR. You pay at the gate, on a first come first served basis; there is no option of pre-booking online. You have to enter your name on a list and sign it, as a disclaimer that lets the site's operators off the hook of liability. So legally speaking you visit the site at your own risk. Time required: between one and two hours, depending on which tour option you choose (see above). You can also stay longer – when I was there, people were invited (once they had paid, that is!) to poke around the openly accessible parts on their own before and/or after the scheduled tours (but once the historical tour got on its way, visitors arriving later had to wait before being let in). Combinations with other dark destinations: Closest by is the Platform 17 memorial at Grunewald station (see also under access). Another fairly convenient combination is the Olympic Stadium to the north of Grunewald. It's one stop from S-Bahn Heerstraße, or an extra 20-25 minutes walk. Grunewald station also provides access to Wannsee (S7), from where you can get to the infamous House of the Wannsee Conference. And buses run all the way to the south-westernmost corner of Berlin at Glienicke Bridge. Trams carry on from the western end of the bridge towards Potsdam. For yet more see under Berlin in general. Combinations with non-dark destinations: The Grunewald forest is the largest green recreational area of Berlin, and lots of hikers and cyclists take advantage of this. To the west, Grunewald is bordered by the Wannsee lake and the Havel River, and not far from Wannsee station there is even a beach from where you can go swimming in the lake. Pleasure boats also ply the waters. Out here you can easily forget you're still within the boundaries of one of Europe's largest cities. But if that's what you're rather after, you'd have to head back to the centre. See under Berlin in general.